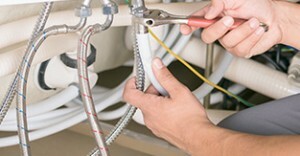 Why choose a professional leak detection service? Pipe leaks can be common in a home, and yet if left unchecked can be devastating – causing damage to floors and walls which can be costly to repair. It may be tempting to try and find the leak yourself to try and fix it, but this can have many disadvantages and leave you with a bigger bill than if you’d called a professional in the first place. The leak may be far away from where the damage arises, so if you attempt to get to the pipes at this point it may not lead you to the precise point of the leak. This means you may have to pay to repair areas that otherwise would have been left untouched. The Equipment: Our leak detection equipment can scan the house and detect the source of the leak enabling us to fix the problem quickly and with minimal damage. The Team: We have a team of qualified thermographers who are experienced in finding even the hardest to locate leaks with their leak detection equipment. The Experience: When working with plumbing it’s important to know what you’re doing. A wrong move can cause water damage, inconvenience and extra costs. Here at Cheshire Plumbers we have many years experience working in the plumbing industry and so can resolve your plumbing issues to the highest possible standards. If you would like to learn more about our plumbing or leak detection services then please get in touch with a member of our team. We’ve built a reputation on being reliable, high quality and reasonably priced and are now a popular choice for many in the Cheshire area.